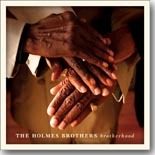 Any new Holmes Brothers CD is pretty much a guarantee to be that month's Pick Hit. Their latest, Brotherhood, is another addition to their rich discography. Boogie woogie pianist Arthur Migliazza has been performing since his pre-teen years. Laying It Down, this month's Surprise pick, shows that Arthur has only gotten better now that he's moved into adulthood. This month's Flashback features a look back at one of many excellent Black Top releases, Out Of Nowhere, from New Orleans legend Snooks Eaglin. Our What's New section features reviews of new CDs from Trudy Lynn, Billy Branch, Lisa Mann, Johnny Drummer, Bryan Lee, Solomon King, Mikey Junior, Cathy Lemons, Jim Byrnes, Lisa Biales, and more.